As we enter the final stretch before the holiday break, the students are focused on more than final examinations. In the last few days they have participated in tree lighting both in Sweet Briar House and in the Quad, concerts, holiday open houses, Christmas Pops and Vespers. In addition to alleviating the stresses at the semester’s end, there is something life-affirming about these activities that hew close to the rhythm and cycle of seasons. I want to discuss with you, if necessarily briefly, the vision that we are developing for the College going forward. Last year, as you well know, the College took steps to make the education at Sweet Briar more excellent, affordable and relevant — and we did so by comprehensively overhauling our academic offerings, budget structure and tuition pricing model. Taken together, they were hailed among the most notable reforms enacted by any college in American higher education. 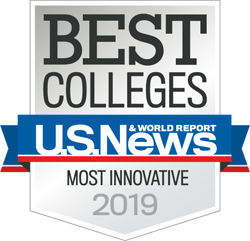 U.S. News & World Report ranked Sweet Briar as one of the most innovative liberal arts colleges in the nation — and more innovative than any in the Commonwealth of Virginia. It is worth noting that this ranking was reputational: top thought leaders in American higher education — at least 60 presidents, provosts and chief admissions officers — voted Sweet Briar over and over again as a leader in innovation. We are playing to win. The environment for small private liberal arts colleges, unless exceptionally wealthy and prestigious, can be unrelentingly harsh. But if we are smart and scrappy, and build our strategy on becoming a national household name that is instantly recognizable for excellence in select areas, I believe we can join the rarefied rank of the finest among American colleges. Sweet Briar is an iconic college, well known for delivering a fine education through mostly small classes, nestled in an environ of unparalleled beauty, both natural and architectural. These distinctions form a bedrock upon which to renew the promise of our college. We should be known for academic innovation that is bold and timely, and for stewardship of our natural and built environment that enables us to claim our place in American higher education. The requirements to bring these ambitions to fruition are significant but appropriate, and we have spent the large part of the past year thinking through them. Following the curricular reset which was announced last year and implemented this fall, our academic distinction will be reflected in the leadership curriculum. At some level, all modern colleges aim to produce leaders (as, for example, in the motto, “Princeton in the nation’s service and the service of humanity”). At Sweet Briar, we understand leadership through what the sociologists call ideal type, based on actual persons and institutions possessing particular traits in question. The women who have graduated from Sweet Briar are typically leaders. They have carried all before them, as pillars of their families, communities and societies; they are women who roll up their sleeves to get things done and to solve problems, and in doing so, make a difference. This kind of leadership is collegial, collaborative, communicative and open-minded — the kind pioneered by the Americans in modern times, and in particular with the advent of mass democracy. It is an art of primus inter pares, first among equals. Our leadership program is unique — none other like it in the country — and we believe that leadership is teachable. In this program we privilege an ensemble of approaches which focus on problem-solving, decision-making, ethical thinking, financial thinking, environmental stewardship, effective communication, creativity, scientific literacy (citizen science) and finally, women leaders in action. Tight and coherent, this program is also based on the fundament of liberal arts education, only more focused and intentional than other general education programs. We also plan to invest in two other academic areas in which we have both opportunity and expertise — the arts and engineering (broadly defined to include science and technology). Throughout the last year we have been refining our distinctive arts program such that, among other things, it will bring world-class artists to our campus through institutional collaboration, particularly with the Virginia Center for the Creative Arts, but not exclusive to it. As we speak, we anticipate with great excitement the arrival of three artists, chosen from nearly 100 applicants, who will work with our students for three weeks in the spring. Engineering is an area that will require far more attention than we were able to provide in the past. Because we are in an exceptional position to deliver excellence in preparing, encouraging and empowering women as engineers and builders of our future, we will give some heft to the program in order that more women can take advantage of it. Most likely this will take the form of a special scholars program that combines scholarships with additional incentives like research support and internships. The investment in these areas of academic innovation will entail faculty recruitment, retention and development; funds for curricular development, research collaboration involving faculty and students; internships and advising. It will also involve equipment and facilities, as well as building renovations. The buildings prioritized for renovations, long overdue, include the Guion Science Center and the Babcock Fine Arts Center. Preliminary designs have been completed by an architectural firm which has worked closely with faculty, students and the administration to better understand the form that best supports academic endeavors. Sweet Briar’s identity, and what makes it so special, is inextricably bound up with the question of land. It is a spectacular and expansive land which, for the first 100 years, was a working farm with wheat, tobacco and rye, as well as cows, pigs, sheep and goats that grazed the fields. In his autobiography, Jan Osinga, who managed the Sweet Briar farm for 40 years, pondered whether Sweet Briar was a college with a farm, or a farm with a college. Without splitting hairs, suffice it to say that the question of Sweet Briar is also the question of land — how we use it to generate revenue, teach our students and contribute to the economy of Central Virginia. Today we are partnering with government agencies, both state and national, and outside experts to design agricultural enterprises that will be regenerative and scientific, as they are financially and ecologically sustainable. They also will create opportunities for our students to engage with the land that they adore. Working with representatives from the board of directors, faculty, students, staff, external agencies and advisors, we have created a plan with a timeline for creating auxiliary enterprises that support our academic mission and which will in short order produce additional auxiliary revenues that can add to our academic investments. The opening salvo was a large apiary northwest of Guion that is adjacent to a new 20-acre wildflower meadow, and east of the Green Barn. No sooner than the bear fences went up and the beehives were installed, some 19 students volunteered to be trained as beekeepers — and soon Professor Linda Fink was offering courses on bees! We have also prepared two sites, about 15 acres each, for vineyards, and plan to install a greenhouse so we can grow and sell our produce to our dining service provider, which should prove budget-neutral. Fruit-bearing trees are also in the plan, as is, possibly, livestock. Finally, I should mention our additional responsibility to steward our built environment. Sweet Briar is not only a National Register Historic District in its core area of the campus, it is one of the most significant legacies of the great American architect, Ralph Adams Cram. While not all of his original designs came to fruition, there is no denying when you study the master drawing that Sweet Briar was meant to be a magnificent college. Again, we are collaborating with national agencies to understand various ways in which we can protect and steward our great inheritance. Let me end with a fine piece of news — that our applications are significantly up, more than twice what it was a year ago, although this ratio will fluctuate. Growing the college back has been an immensely laborious process but also deeply gratifying. As we stay focused, with our eyes on the prize, I am enormously proud of what we have together accomplished, and look very much forward to the new year. Happy holidays and Happy New Year!